Last month we introduced you to an old friend: the light colored 56 F-l00 owned by Jim Reis of Classic Performance Products. After several appearances over the last year and a half, we talked Jim into pursuing the project full-bore in the hopes of bringing it out to the shows next spring. Since the frontend had received a dropped axle, new leaves, and disc brakes, the next order of business was to follow suit in the rear. Last month we stripped the back half of the truck down to the bare , frame and removed the old shock crossmember. Jim and his right-hand man Alan Crouse then installed the new hangers and leaves from Total Cost Involved. The new spring kit relocated the axle housing above the springs to get the rear of the truck down some. This month we'll get the axle shafts redrilled to match the front discs, get the 9-inch housing cleaned up, reinstall the rearend, and bolt up the new shock crossmember and shocks. Next month we'll install the CPP rear disc kit-complete with new lines and e-brake cable. So stay tuned, because there's a whole lot more in store for the Effie. Now we'll get the 9-inch up to par. This particular one came from a '57-60 Effie, which was when the 9-inch was introduced in place of the aging Dana. Jim wanted his wheels to be the same bolt pattern front and rear, so we needed to red rill the stock 5-on-51/2 axles to match the 5-on-5 bolt pattern from the upgraded disc brakes already up front. The first step was pulling off the drum and all of the brake hardware. Then the four retaining bolts were loosened and removed. The axles were then pulled out as Jim held the backing plate in place. It's very important that these holes are drilled exactly right. Check out the equipment that is used. The measurements are pinpointed to ten-thousandths of an inch. Unless your drill press can do that, we'd suggest not trying this at home. The axles were cleaned up, and the studs were pressed in. We fit each axle with a new rotor to make sure the studs were in straight. With the axles done, we moved on to the housing. Jim cut the old spring pads from the top of the housing off with a cutting torch. If you're not so inclined, you can use a cutoff wheel or reciprocating saw. Jim finished cleaning the residual weld from the area by alternating between a 4-inch grinder with a 50-grit flap disc and the wire wheel. 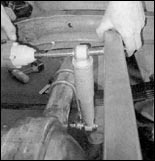 The location of where to weld the new springs pads to the housing tubes was determined by setting the axle housing in place and measuring according to the directions supplied in the kit-making sure that the rearend was in even side to side. Jim also test-fitted the new shock cross member and drilled out the holes to 7/16 inch. Alan and Jim double-checked the placement of the spring pads by measuring from the axle centerline to the outer edges. Since these measurements were dead on with the first ones, we figured they were in the right spot. 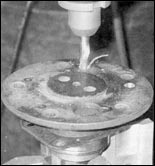 Once the side-to-side measurement was set, the pads must be positioned five degrees down from the pinion. 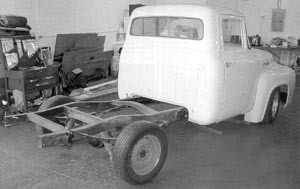 The housing was set on jackstands and leveled. The pinion was set at the required five degrees down, and the pads were set at zero. We marked it to be safe, and Jim tacked it before it had the chance to move. Once everything was double checked, the spring pads were welded solid to the housing with a MIG welder. 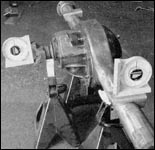 The 9-inch was set into place and bolted in using the U- bolts and spring plates. 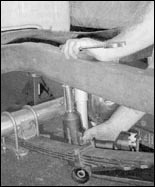 The 7/16-inch bolt that held the shock cross- member was tightened down. .. .followed by the lower mounts. which are incorporated into the lower spring plate. Alan then drilled a hole in each framerail directly above the axle housing and mounted the new polyurethane bumpstops. The old truck is starting to look petty good now. Next month we'll install the axles and disc brakes, along with new lines and e-brake cables. And we have a few surprises alter that. So stay tuned!